The dates of FOOD DRIVE FOR NORTHWEST HARVEST is extended through Friday, March 6th!!!!!!! 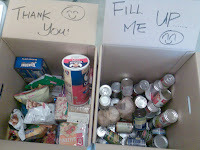 We are expecting to receive more and more through til the end of the food drive. Academic clubs on campus may introduce this event and raise fund among the members. Besides, GDP Club CAN only take food donation! We also love to deliver 11 boxes of food to serve people indeed, but it can’t happen without our club memebers' kindly support. Volunteer in our team!! & we need 2 volunteers for each period. Thank you in advance for your support. *Please be aware that we are ONLY open from 8:30 am - 1:30 pm with our new schedule.